Map shows developments from 1829-1842. The fourth article of the Treaty of Prarie du Chien, 29th of July, 1829 granted to Archange Ouilmette, a Potawatamie woman, wife of Antoine Ouilmette, for herself and children, two sections of land. 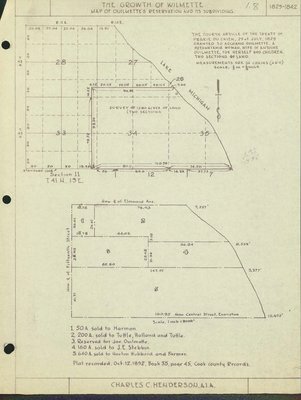 Survey of 1280 acres of land two sections; Now Elmwood Ave.; Now Central St., Evanston; 1. 50 A[cres] sold to Harmon; 2. 200 A[cres] sold to Tuttle, Holland and Tuttle; 3. reserved for Joe Ouilmette; 4. 160 A[cres] sold to J. E. Stebbin; 5. 640 A[cres] sold to Horton Hubbard and Farmer; Plat recorded October 12, 1892, Book 55, page 45, Cook County Records.